Photographing the couple portrait to me, and making the image a work of art, is why I am a wedding photographer in Charleston South Carolina. I love photographing weddings at Wild Dunes Resort, located on Isle Of Palms, SC. 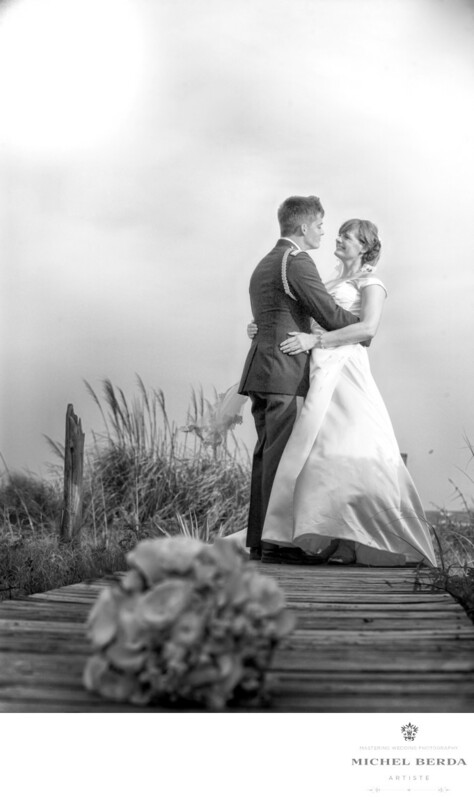 I photographed this beautiful military wedding there just last year. This beautiful couple and this image I made on the deck at Wild Dunes Resort, in Isle of Palms, SC, is sure to represent that feeling, the love they have for one another in this beautiful B&W image. It make you feel like you are right there, I love the wooden deck, the dunes in the back and the sky. Being creative with this image I put the bouquet in front, but yet focus on the clients, to show the sky, the light that was perfect , while the couple were very comfortable with each other, the nice part is that the wind caught the bottom of the bride dress witch shows her shoes. This image captured at Wild Dunes Resort in Isle Of Palms, Sc, is natural to represent their wedding day, and this very beautiful venue.Keywords: Destination Wedding Photographer (117), isle of palms (30), Isle Of Palms Sc (18), Isle Of Palms Wild Dunes Resort (18), sc (309), Wedding photographer In isle Of Palms (18), Wedding Photographers (198), Wedding Photography (123), Weddings (168), Wild Dunes Resort (21).